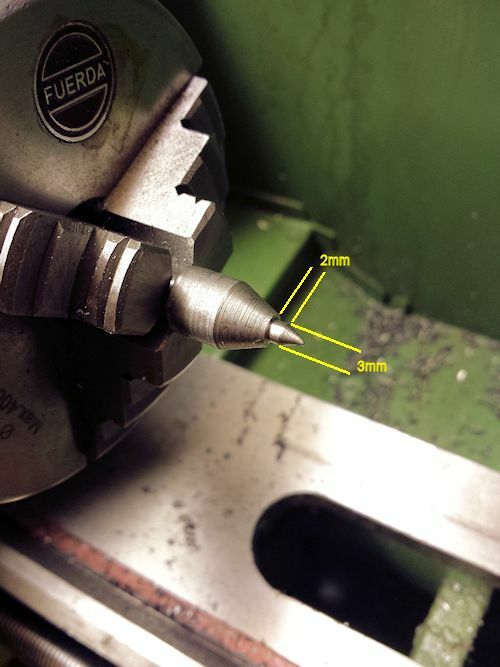 Having used the lathe a few times lately I thought I'd revisit the mod I'd done to stop the autofeed, although it worked, the position that it stopped at was a little unpredictable. What it needed was a spring tensioned lever that snapped fully off when it hit the stop. Here's the concept I've come up with, not dimensionally accurate but a starter for ten. 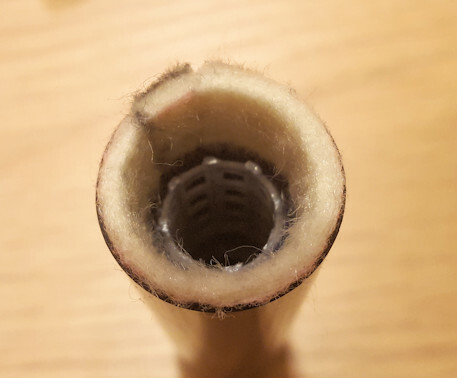 It's been a while since my last post and to be honest I've not been doing much with the lathe but I had a new air rifle and wanted to make a new silencer for it and fancied doing in in Carbon Fiber tubing instead of the usual Aluminium tube. I purchased some 25mm tube from Ebay and made some end caps out of aluminium, I didn't really have any design in mind I just started to do it and went with the flow. I ended up making a bit longer than required and used the drill press to drill the holes around the edges to help the air escape into the felt. nice but a bit too shiny for me and although it made the rifle a bit quieter I think it needed to be a little bit longer so I then made one 6 inches long but this time I used Black Delrin for the end caps. I have to say I like turning the Delrin it's so much easier to machine. This time I made the front cap a push fit into the tube without any extending past the end of the tube, I thought this looked a bit cleaner. This longer one once definitely quieter than the 4 inch one. I think I'll try a 30mm tube next to see if that makes it even quieter. Whilst trawling around the net I came across a really useful utility on a Blog written by lathnovice. 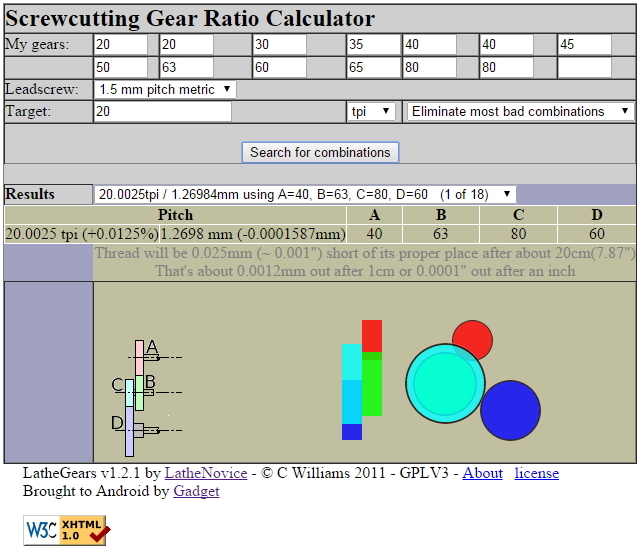 Where this utility varied from the others I found was that it came at the problem from the other direction, instead of entering your gear configuration and seeing what the TPI or pitch was you could enter your gears and the pitch or TPI and it then calculated the gears you needed, the position they should go in and even the error in the pitch if you were trying to cut imperial threads on a metric leadscrew. 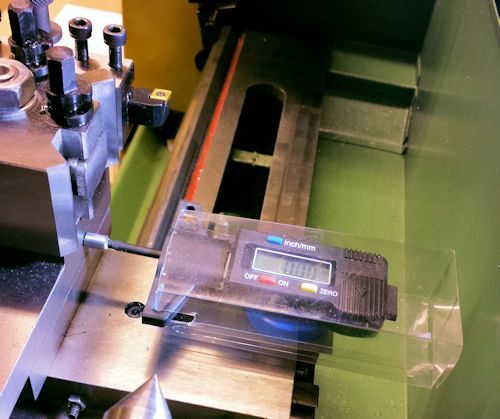 I purchased one of the 63 tooth gears from arceurotrade hoping to cut imperial threads on my metric lathe and this utility proves that it can be done and the error in dimensions is less than with the standard gears. And, as usual, I thought to myself "that would really be useful as an app on my phone"
So after looking at the source code and scratching my head for a while I thought the easiest way would be to use Appinventor and create an app that just displays the code in a Web viewer so you can use it off-line. 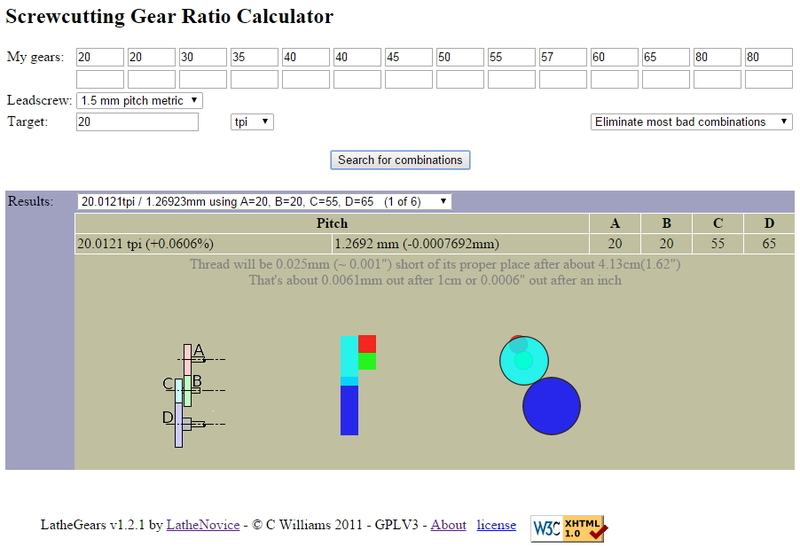 I reduced the number of gears available and moved some of the info around so it would better fit on a phone screen. I've checked with the creator and he's happy with this so here are some links. Another project for my lathe is a way to stop the auto feed automatically instead of me having to raise the lever myself. 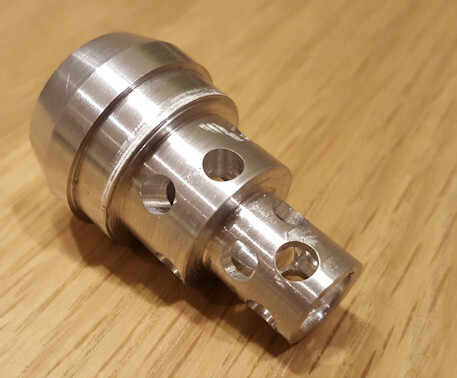 There are a few mod's out there already which address this issue with the mini lathe but they require quite a bit of machining or fabrication of brackets. I spent some time standing and staring at the lathe trying to come up with some ideas that need the least amount of interference with the lathe and not a lot of machining. 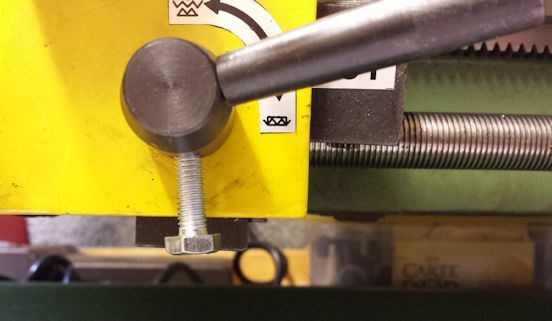 I came up with the idea of adding a second arm to the half nut lever that points downwards when the autofeed is engaged, this would then hit a striker that could be adjusted along the axis of the lathe bed. 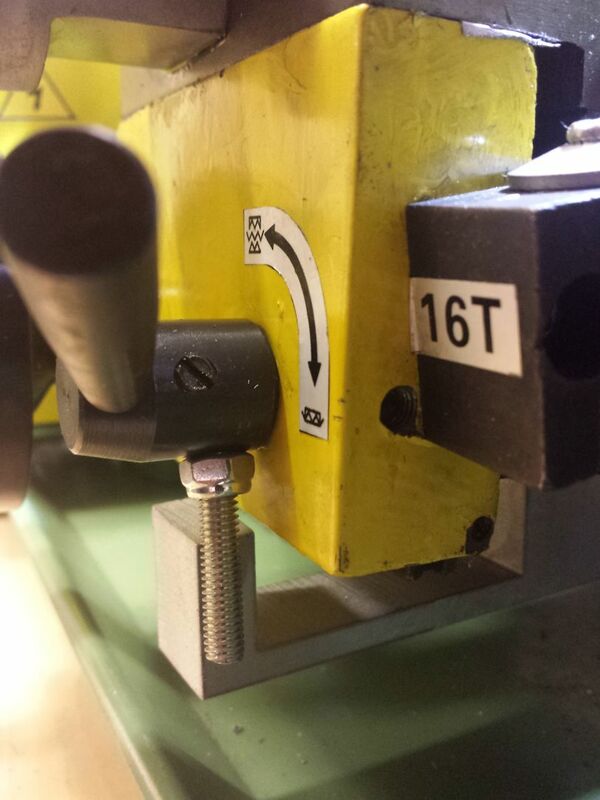 The bolt was for testing purposes, I intend to install a shaped lever with a flat surface etc. The next challenge was to make something that would fit to the lathe and be adjustable and not interfere with the normal use of the lathe. 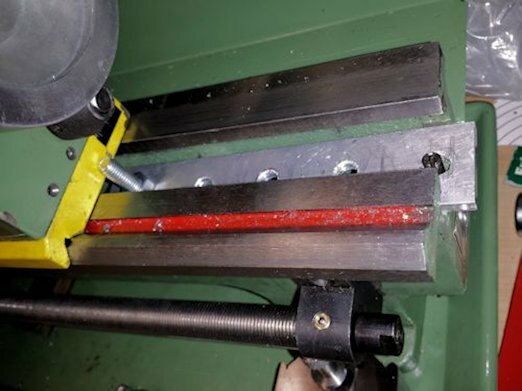 I thought about a block of wood secured to the control box housing with a length of threaded bar sticking out to hit the lever as it traveled towards the chuck but his meant that I would need 2 or 3 different lengths to cover the range of travel needed. I considered having something clamped to the lathe bed that would stick out and down to hit the lever but this my get in the way and need to be removed in normal usage. After owning the lathe for a couple of months an getting used to it I decided it was time to attempt cutting threads, I'd watched loads and loads of YouTube videos on the subject and felt I'd got the basic idea so it was time to give it a go. I'd bought a quick change toolpost which would allow me to swap the cutting tools without having to shim my tools for their different heights, I went for a Myford type from Warco but it needed a 11.2mm stud whereas mine was only 10mm so it was just the project I needed to try out turning a new toolpost stud to fit. 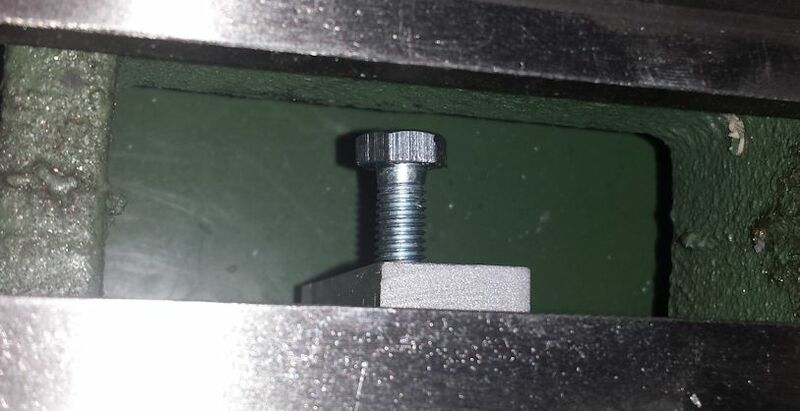 After changing the gears to get a 1.5mm pitch I found that whenever I engaged the leadscrew it would force the reverse tumbler gears out of mesh without even trying to make a cut...... not good! After a phone call to Warco and a discussion with the technician I decided to see how difficult to turn the lead screw was and yes it was very difficult to turn, not really possible with my fingers even with the gear removed from the end. I removed the two cap screws from the right hand bearing and it sprung away from the lathe bed around 10mm, hmmm! 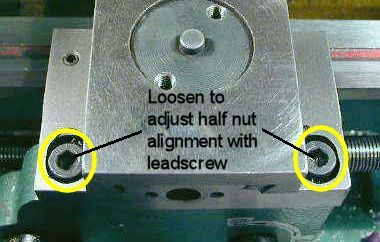 I thought I'd found the problem, the leadscrew was not parallel to the lathe bed, something at the other end was out of true. After removing the leadscrew and inspecting the left hand bearing I noticed that there seemed to be a clash between the bearing and the bracket that hold/adjusts the 'B' and 'C' gears. 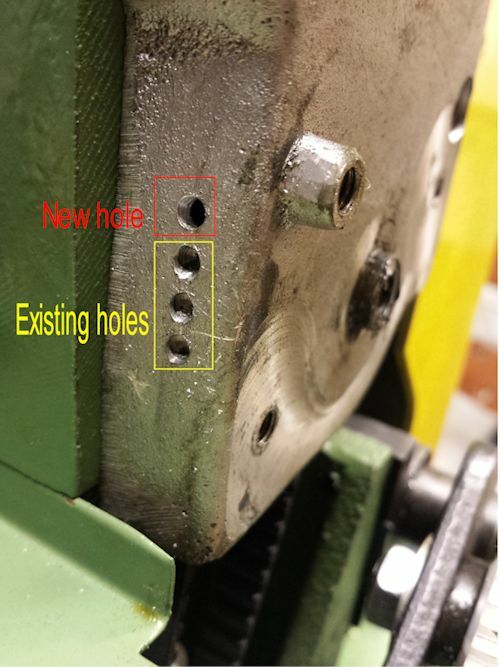 I removed the bracket completely and enlarged the hole where the clash occurred with the bearing. Still with the bracket removed, I re-fitted the leadscrew and checked how free it was with both bearings re-fitted, it was still a little stiffer than I thought it should be but easier than with the bracket fitted, whenever I tightened up the right hand bearing it was stiffer to turn so I added a thin shim under the left hand bearing and then it ran freely using my fingers when both bearings were fully tightened down. After re-assembling the bracket and gears I then aligned the apron by loosening the cap screws and engaging the half nuts then re-tightening, when you engage the half nuts the leadscrew should not move significantly side to side, if it moves upwards the you may want to place a shim between the apron and the cross slide. I then turned down part of the plunger to give it a 3mm (just under) parallel section that would go into the new hole and secure the direction lever in place. The plunger still has the tapered point so it will still work with the other two detents. 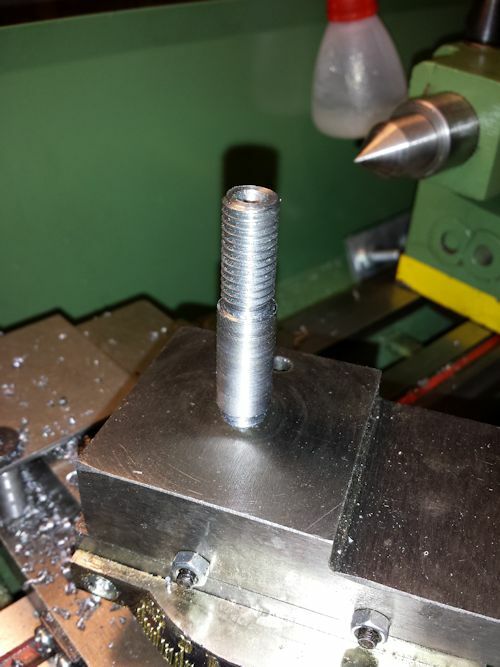 Following these refinements I successfully made an new stud for my quick change toolpost, I also thought the lathe was a bit quieter as well. 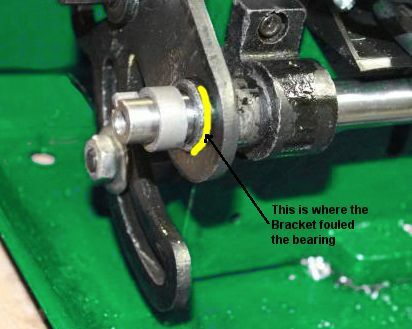 One of the things I've found annoying about this lathe is the fact that the tailstock tends to slide backwards, even when clamped, when I'm trying to drill with a centre drill it pushes the tailstock backwards instead of drilling the hole. 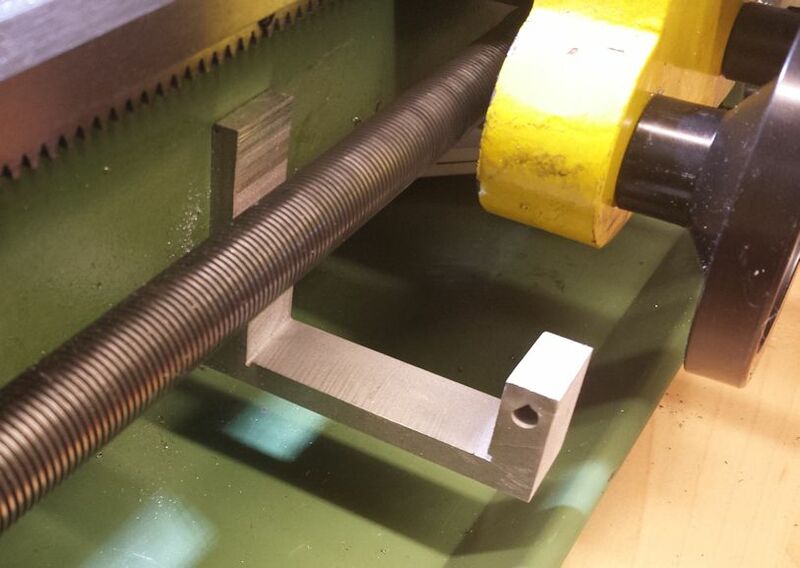 I suppose I could look at making a longer T nut with more surface area for the tailstock but, as yet , I don't own a Mill so I'll have to make do for now. I had an idea to stop this from happening with a bit of aluminium I had in a drawer. The idea was to place the strip of aluminium through the gap in the bed to rest on the ribs and the bolt shown would rest against the rear of the tailstock and there would be another bolt going downwards to push against a rib of the lathe bed therefore stopping any movement of the tailstock rearwards. 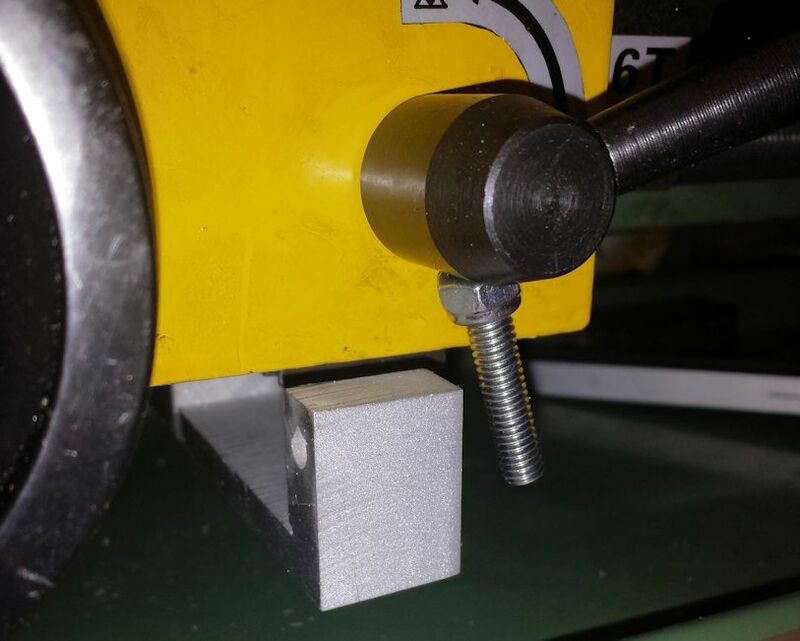 I then realised that I could probably use the stud that I assume is used to stop the tailstock sliding of the end of the bed as a stop, this way I can adjust the position of the stop by using the different holes in the aluminium strip. I will admit this looks a bit 'Heath Robinson' and I may try to make a better looking one later but for now it does the job. A proposal for the next one maybe? Don't forget to divide the amount you want to remove from the diameter by 2 as you are removing material from both sides .... sort of. 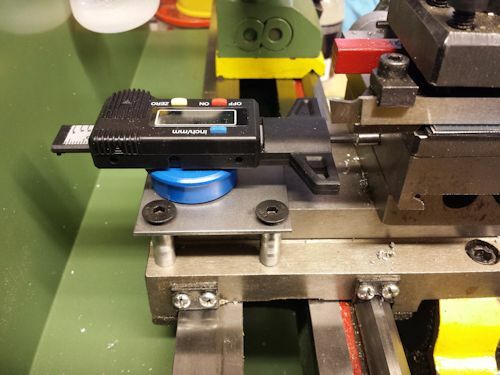 Using the dial on the slide is OK but I've seen lathes with digital readouts, how much are those I wonder? After some research I found a really good alternative to the standard slides and readouts available from the usual suppliers, I found a DIY version for around a fiver (£5) plus a bit of DIY. It's based on this digital LCD tyre depth gauge off ebay. It's basically a variant of the digital vernier but without the sharp pointy bits. I attached mine on the cross slide by mounting a piece of steel plate using the travelling steady mounting holes (at least I think they are for the travelling steady) this then allowed me to use a magnet to stick the body of the gauge to, the end of the plunger has a magnet glues to it so that it will stick to the cross slide. 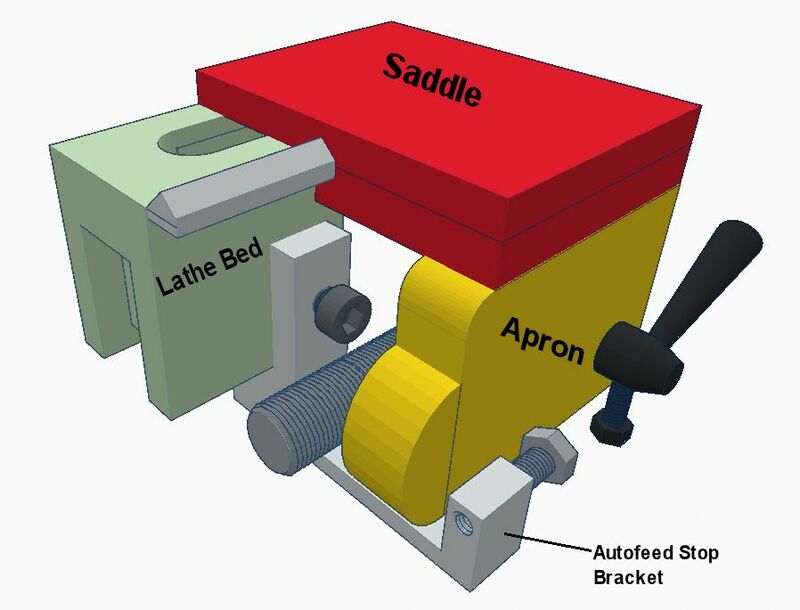 It could also be stuck on the lathe bed and measure the saddle travel. 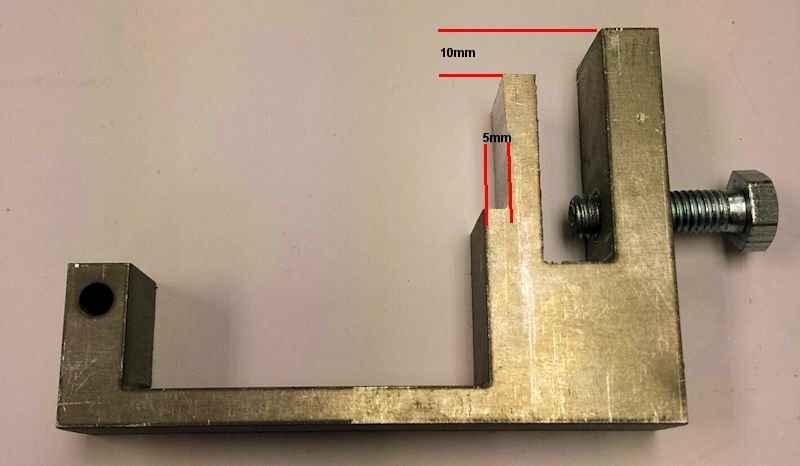 The plunger magnets are basically 2 very small neodymium magnets glued inside a small mild steel tube (turned on the lathe 7mmx4mm with a 2mm hole but these dimensions can be what you need) glued on the end of the plunger. 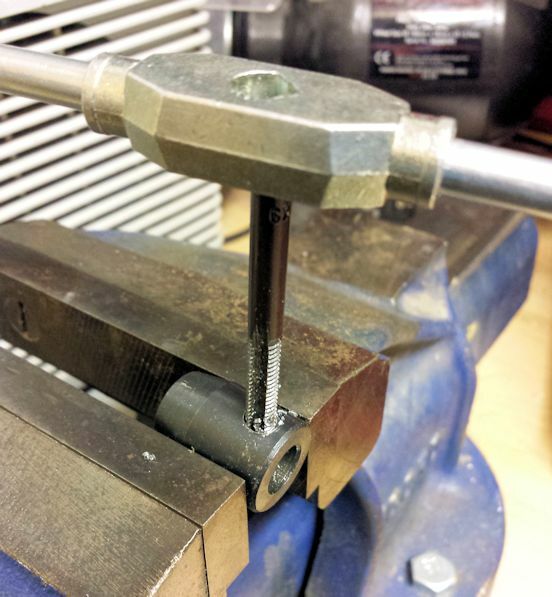 One of the problems with the mini lathe is actually finding space to mount the gauge as there's not a lot of room. What I like to do is touch the tool to the material to be cut and set the DRO to '000' then move to tool to the right and move in the tool until I've reached half the amount I need to remove then reset the DRO to '0.00' and then turn down the material until I reach the '0.00' point and that's that. So far I've found it quite accurate but noticed that it gets covered in swarf when in use, I thought about forming a piece of thin perspex to curve round the gauge and protect it from chips but then found an empty rectangular packet in the recycling bin that was about the size of the gauge but made of clear plastic, thin but strong enough to keep it's shape, this slid over the gauge and protected it completely and was flexible enough to still be able to press the buttons. It's also possible to connect to these gauges and get a serial data stream that could be read by an Arduino and shown on a larger LCD and there is a project out there that uses a Bluetooth interface to display the data on your smart phone here, one for my other blog maybe. As I imagine most people do after buying a lathe nowadays, I also spent a lot of time watching YouTube videos. One of my favourites is mrpete222 AKA Tubalcain, he's a retired teacher in the states who's done hundreds, if not 1000s, of videos on Milling, Turning and even casting aluminium parts, a definite must watch. 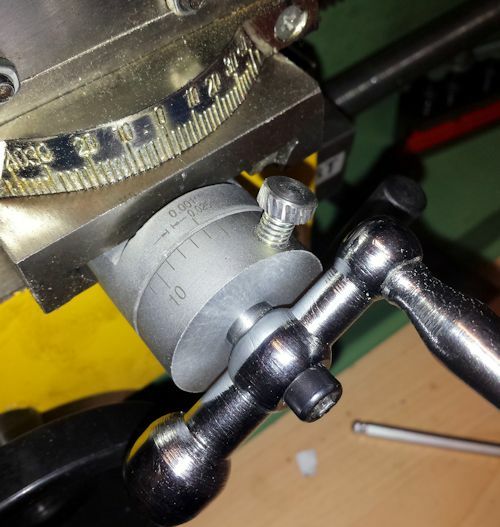 One of the little jobs he did made me think about doing the same thing for my little lathe, a knurled thumb screw to lock/release the measuring dial on the cross slide. This replaces the supplied grub-screw and lets you set '0' on the dials as a deference point and then lock it in. Instead of turning the M6 thread from scratch though I cheated by using an M6 Bolt, all I did was shorten it and turn down the head so it was round and then I would have knurled the head ...if I had a knurling tool .. as I don't I just took my Dremel clone and put some cuts around the circumference of the head. 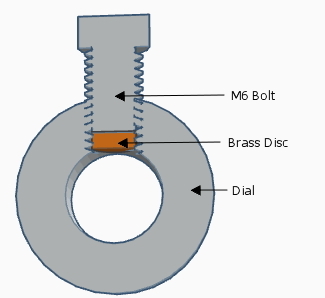 I also turned a small brass disc to put under the screw to protect the shaft from wear. All in all it works pretty well but my next project meant that I don't often use the dials on the cross slide ... that's in the next post. So, once the decision was made to buy a lathe the next step was to research what was available within my budget and where would be best to get it from. The second decision to be made was to buy new or second hand. seem to be one of the more common makes on the second hand market. 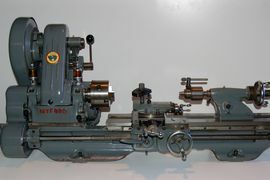 After looking through quite a lot of adverts for second hand lathes I decided that I didn't really have the experience needed to be able to look at a lathe and decide if it was OK or not and, even second hand, the cost was often more than the cost of a budget mini lathe. Another thing to consider was the distance you may need to travel to pick up the lathe and don't forget, they are quite heavy. Anyway, I decided to buy a new one and this would need to be an online purchase as there aren't any suppliers anywhere close to me. Based on my web research it looks like the main contenders in the budget lathe market come from China made by a company called SIEG. There are 3 main spec's of lathe, C1, C2 and C3, the C3 being the best spec. These lathes are sold in the UK by distributors and there also some customised versions badged as their own brand. The cost varies between £350 - £600 for one of the mini lathes, here are some of the places I looked. I eventually bought mine from Warco.co.uk, (link) mainly because it came with a slightly better spec. than some of the others and also the price included courier delivery. Having had the lathe for a few months I did come across a few quality issues that needed addressing and this is where I found out what a good company Warco was to deal with. Whenever I had an issue with anything Warco always had someone ring me back to discuss the issue and then sent out new parts straight away, this was quite a pleasant surprise because my experience in dealing with most companies, when things go wrong, is usually a nightmare. I will be going over some of the issues and solutions in later posts.